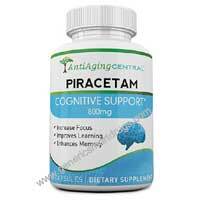 What is the working mechanism of piracetam? It is believed that this works by improving the functions of the neurotransmitter acetylcholine, a kind of neurotransmitter that is supposed to cause memory consolidation. It potentiates the activities of the acetylcholine in the brains. Though the work of the piracetam drug is vaguely understood and there have been immense experiments that have been conducted to prove the functioning procedure of this drug. This also has helped in the modulation of membrane fluidity. As a result, this has certain effects on the release of the neurotransmitter and receptor binding. This piracetam drug has a list of benefits that have been proven to be effective and have been proven to give a positive effect. This has marvelously worked to be a powerful cognitive enhancer but it is also helpful in treating various maladies that is depression, schizophrenia, epilepsy, to alcoholism, and different age-related cognitive declines. The exact procedure is not known but it increases the blood flow by increasing the blood cells that increases the oxygen and nutrients more rapidly and effectively. While this drug is not a stimulant but it also affects vascular and neuronal functions as soon as it enters the central nervous system. These chemicals are crucial for enhancing more learning abilities and also crucial for enhancing the concentration power. The increase in synaptic plasticity helps in connecting and maintaining the new neurons that are required for the learning skills. It has also been reported that this drug enhances both verbal fluency and creativity as well as improves the focus when it is taken with choline. This pircetam drug helps in increasing verbal learning that includes the fluency as well as the creativity, more prominently when this is taken with the choline. This also helps in enhancing verbal learning in both healthy children as well as children suffering from dyslexia. This piracetam drug has been proved to be a powerful memory enhancer when this is taken in combination with choline. In adults, this works by improving the blood flow to the brain and this also helps in improving the cellular membrane fluid. This drug has however shown to improve memory in all the ages of person. This has been said that this drug is a reliable mood enhancer and is also effective in depression treatment. This has worked effectively in treating impaired coordination, stress anxiety and also works effectively in relieving the symptoms of depression. This drug has decisively shown powerful neuroprotective properties that helps the brain against age-related cognitive decline. This drug has also been used successfully to patients who are supposed to undergo open heart surgery and patients suffering from a stroke. This drug not only helps in managing the healthy brains that are aging from cognitive decline but it also helps to increase cognition in patients suffering from dementia. The anti-convulsing properties of this drug make it a good adjunct for the treatment of epilepsy and other seizure disorders. The optimum single dosage that increases the cognitive power in an adult is said to be more than 4800 mg. this dosage is divided into the whole day and is supposed to be taken 2 to 3 times per day as needed. Some studies have also proved that the dosage structure of this drug should not be more than 1200 mg that should be split in 2-3 doses days per day and the results can be seen easily in 14 days. This dosage range is suggested when this drug is taken on its own and is not stacked with any other medication. You can notice effects after taking the doses but you will be noticing a significant change only after a period of 14 days. The side-effect of this piracetam drug is considered to be very rare as this drug does not show any side-effects. The entire racetam family is supposedly very safe to be used with low toxicity, but reports include that it may show some side-effects like a headache, anxiety, and insomnia. Normally when it is stacked with the choline supplement it shows less side-effect. Overall this piracetam drug is one of the most well-researched, brain-boosting nootropics whose sale has noticeably been increasing the memory and the learning capabilities have become smarter and more enhanced day by day. This drug is the most used drug and so people who have healthy brains and who are suffering from some disorder still prefer to buy piracetam online for supporting their brain activities.